Great time to start writing about the Celtics on the blog as our guys have won their last four games in a row and seven out of the last eight. The Celts finished off the week with a 98-80 win over the Grizzlies. It was a game that the Celts had no trouble with as the Grizzlies have been hit pretty hard by injuries over the course of the year. While the Grizzlies had been picked to be a surprise contender in the Western Conference, losing big men Darrell Arthur (Achilles-Season ending) and Zack Randolph (Torn MCL – Back Early March) put a major dent into their team and they have struggled to stay around .500. On top of those two, former Celtics defensive stopper Tony Allen missed the game with a sore hip and knee. The Celts looked great though. Rondo in his second game back was his usual self, while he only had 5 points, he had 14 dimes. Jujuan Johnson looks like he’s going to be stealing most of Stiemsma’s minutes from here on out as he got 22 minutes tonight and responded with an efficient 10 points on 5-8 shooting. Kevin Garnett had another 3-pointer to get his season tally to 3-3, as he posted 24-9. 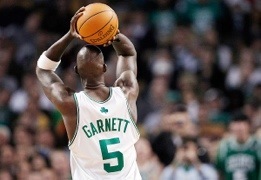 After the game KG was questioned about his ability to shoot the threes, he told people to stop being surprised. But the big story of the day is Paul Pierce. The Truth had another great all-around game as he posted 21-6-6. The big turnaround in the Celtics season has been Pierce getting in shape. When he’s playing well getting to the line, hitting his open threes, and keeping the ball moving the Celts look unstoppable. Once he started to get his game legs underneath him the Celts have been on a tear. After his 21 points against the Grizzlies, he finds himself only 9 points behind the Legend for 2nd place on the Celtics all-time leading scorers. Look for another article on the Truth’s greatest five moments as a Celt later on today. This entry was posted in Celtics and tagged Bobcats, boston sports blog, celtics, Grizzlies, Jujuan Johnson, kevin garnett, kg, Larry Bird, paul pierce, Zack Randolph by leibo4. Bookmark the permalink.